I do not want to look my age. I don’t act my age so why do I have to look my age? There are a lot of really awesome things about being 40+ years old. We get to this place in our lives and everything is pretty darn good. What is it with the sun spots on my face? I want to have the wisdom of age without the look of age. Help!! Out of nowhere Sun Spots on my face! 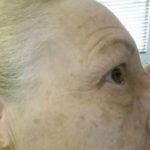 Sun Spots and Age Spots are not one of them. They make your face all blotchy and uneven. And no matter what, they make you look older.You don’t really notice as they are collecting on your face until there is a whole army of them. They have moved in! And they look like they are here to stay. The good news is they are very easy to remove from any part of the body. You are more likely to have them on your face, chest and hands. But any area that has been repeatedly exposed to prolonged periods of sun is fair game. Depends. Your skin is trying to protect itself from the damaging sun.The Melanites kick it up a notch and produce a dark barrier to protect the under layers of skin. With a laser It is very easy to target only the dark spots. Sometimes it takes two or three treatments. But then they are gone. They just slough off in the shower over a week or two It is absolutely fantastic. Half way to NO SPOTS! and loving it! I look at the before and after pictures of my face and am so pleased with the “after” look. It has taken ten years off the look of my face. Tattoo Mistakes How to fix them - Skin City Laser, Henderson NV on Does tattoo removal work?